The 1941 "Subway" Series pitted the Brooklyn Dodgers against their cross-town rival New York Yankees. Little did America know they would be pulled into World War II two months after this Fall Classic, with the Bronx Bombers and Dodgers ironically about to wage a war of their own. Entering Game#4, the Yankees held a narrow two games to one lead, but the Dodgers entered the ninth inning clinging to a 4-3 lead, looking to tie the Series at two games apiece. After two quick outs, "Old Reliable" Tommy Henrich was the Yankees final hope, and with two strikes appeared to strike out on a filthy curveball (possibly spitball?) from Dodgers crafty pitcher Hugh Casey. Unfortunately for Brooklyn, catcher Mickey Owens couldn't catch the third strike with Henrich running to first on the gifted passed ball. The Yankees then capitalized "big-time" on Owens' miscue with hits from DiMaggio, Keller and Gordon (as well as a walk to Dickey) leading to four runs and a 7-4 Yankee lead! 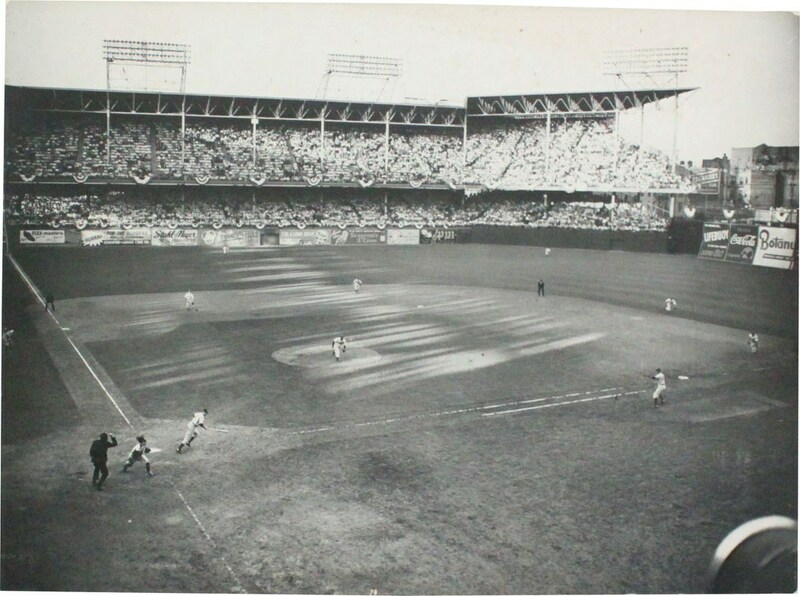 A stunned Ebbits Field crowd watched in disbelief as their beloved Dodgers went quietly in the bottom of the ninth, with the Yankees eventually winning game#5 to claim the 1941 Fall Classic. This magnificent heavy cardboard stock and oversized black & white image miraculously portrays Owens running after the missed third strike, as well as a complete Ebbits Field backdrop for this historic event. Measuring approximately 10" x 13-1/2", you can clearly see Owens pursuing the horsehide sphere as Henrich, looking over his shoulder, starts his indelible trip towards 1st base. 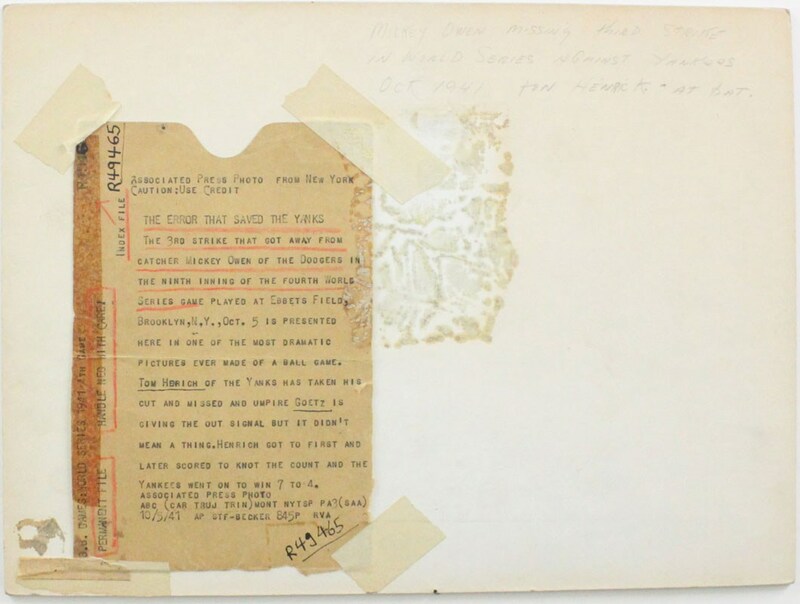 Incredibly, the photo measures 1/8" thick, with the verso revealing a critical "10/5/41" dated caption detailing this momentous World Series moment. Extremely rare and possibly unique, it reminds us of how a simple "botched" third strike may have cost the Dodgers their inaugural championship, with Mickey Owen's miscue still standing as one of our National Pastime's legendary World Series moments! Unfortunately, this photo has a glued on, cardboard backing. Therefore PSA cannot deem this photo a Type 1 even though it is believed to be.